Demonstrations of intelligent connectivity were on-hand at “Innovation City” during the Mobile World Congress Americas conference at the LA Convention Center September 12-14. The conferences are held annually in the U.S., Barcelona and Shanghai. They are put on by the GSMA, (the Groupe Speciale Mobile Association), which represents the interests of mobile operators worldwide, uniting more than 750 operators with over 350 companies. Bee Corp/NimbeLink: Honeybees are essential for agriculture with one-third of the world’s food supply dependent on honeybee pollination. Honeybees are vulnerable to a combination of parasites, pesticides and climate change. The Bee Corp and NimbeLink have developed a hive tracking and management system. 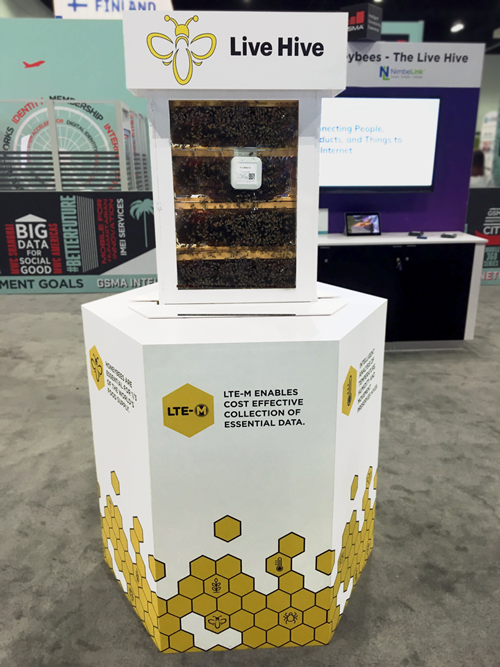 This intelligent agriculture system combines the latest LTE-M cellular networks, with smart IoT asset tracking and the latest hive health and data analytics – with the end goal of improving the sustainability of natural pollination. (LTE-M is an acronym for Long Term Evolution for Machines. It’s a low-power, wide area technology which supports the IoT and provides extended coverage). NimbeLink, with HQ in Minnesota, provides cellular-based services and products. The Bee Corp, with HQ in Indiana, developed decision-support software powered by real-time sensor monitoring and hive data analytics. Unmanned Life: This London-based startup is a 5G-networrked, autonomy-as-a-service provider. Its software platform manages unmanned ground vehicles, aerial vehicles like drones and other robotics systems — all through a single interface. It’s supported by the UK’s government. At the conference, it demonstrated the value of combining 5G, AI and IoT to show what will underpin the upcoming autonomous economy, specifically in areas like industrial automation, urban management and emergency response. It’s go-to-market strategy is to work in synergy with major industrial conglomerates in multi-billion dollar sectors to facilitate the fourth industrial revolution. It did a live demonstration of multiple robot and drone swarms working together, autonomously, using 5G network capability, indoors, in a coordinated manner. It was significant because the robots and drones did not rely on GPS or motion sensing, but were powered solely by the company’s software platform.